Sometimes mistakes can happen with large format photography and you end up not being sure about the result of the mistake. Or what to do with the unpredictable and interesting results. My usual mistakes are light leaks, out of focus images or overexposed negatives. 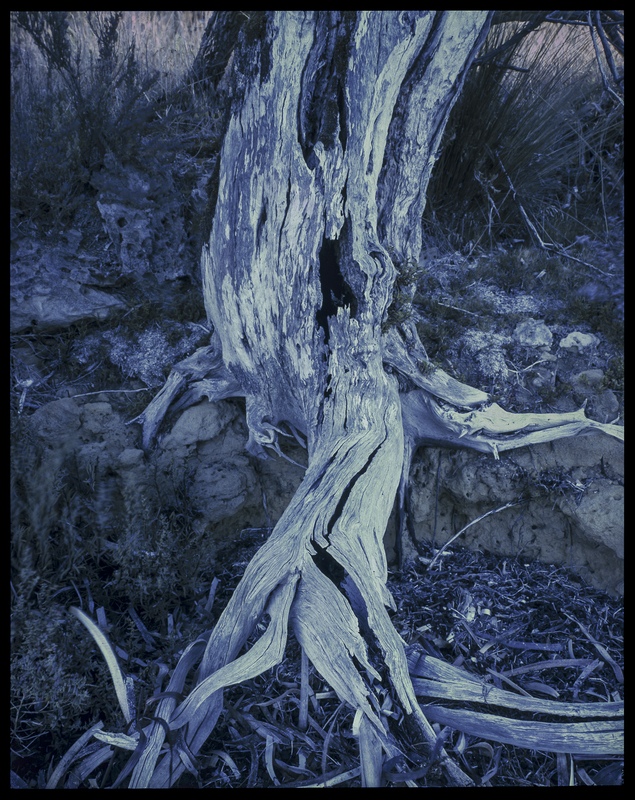 A different kind of mistake that I recent experienced was when some of my 5×4 colour negatives that I’d made on a photo trip to Kangaroo Island in South Australia were cross processed by the photo lab as E6 chemistry instead of C-41. Cross processing is trade slang for putting a film through the wrong processing chemicals. Usually it involves processing E6 transparency film through the C41 process, and the results can be rather wacky. I was taken back when I saw the results. Stunned, in fact. Then disappointed. My initial reaction was that all that work I’d done on the island had gone down the drain. I just wasn’t into special effects photography–ie., looking to achieve a muted image with low saturation, or surreal images and I realised just how straight or classical my large format photography is. I haven’t looked at these images until now. I’m still not sure what to do with them. I do realise that some people do this kind of cross processing purposefully—as a visual experiment by the photographic avant-garde through throwing out the rule book, by using a few filters, under expose and push or overdevelop the film to give higher contrast and unusual colour caste?–to explore the world of weird colour. When you cross-process film you can never be quite sure how things will turn out, but that is the fun of it, especially when using toy cameras that tend to have light leaks and colour bleeds.This gives a sense of otherworldliness to the picture. I presume that Photoshop is now used to achieve similar results. 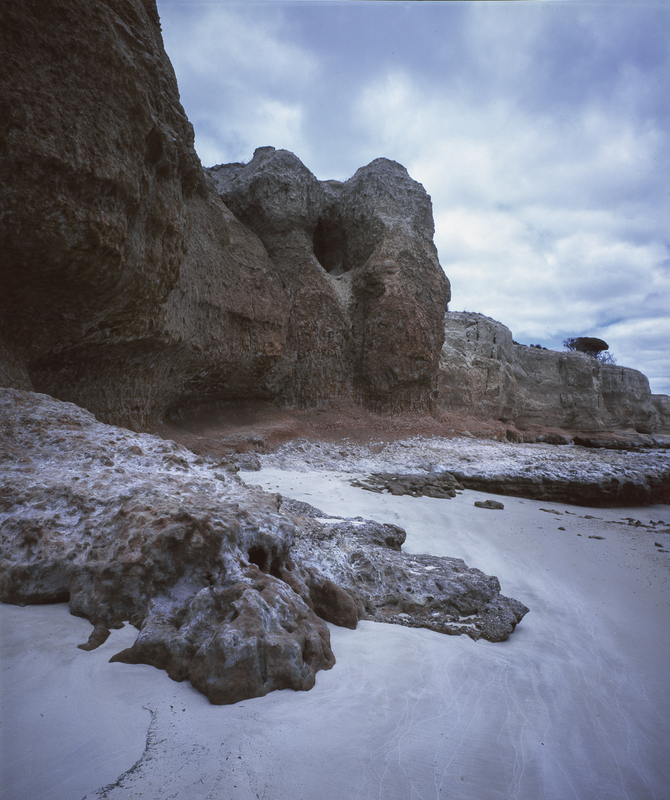 Another cross-processed image from the same photoshoot on Kangaroo Island, which has been colour corrected by the lab. There is now a blue cast rather than an orange one. 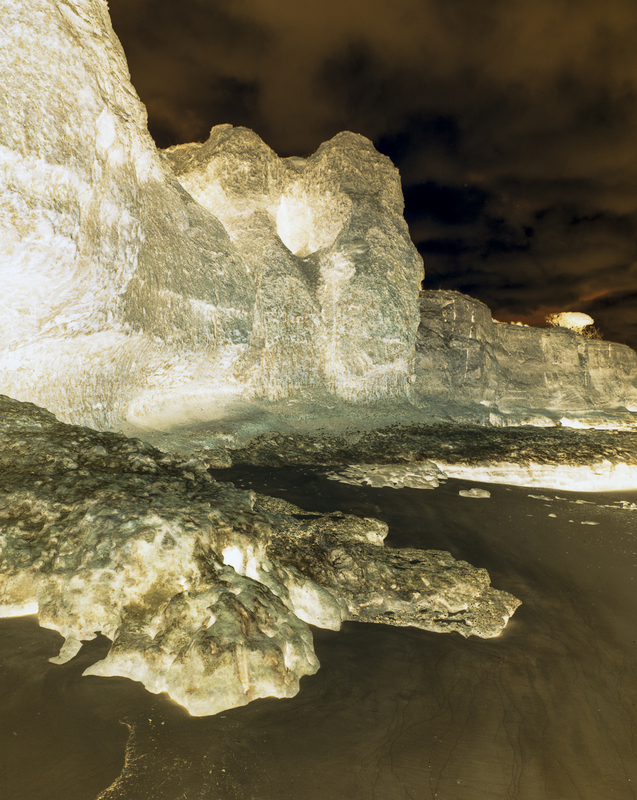 It still has a muddy, flat look and the bright whites tend to blow out into a weird neonish blue. To do this properly–eg., with expired film— you need to you would need to overexpose the film by about a stop and then push it in processing by a stop or 2.